The Bell UH-1 Iroquois (nicknamed "Huey") is a utility helicopter that has become iconic throughout its career: first introduced on massive scale (7000 units deployed) during the Vietnam war, the Huey has since become an iconic legend famed for its reliability and robust design and as such is still in service today in both military and civilian aviation. 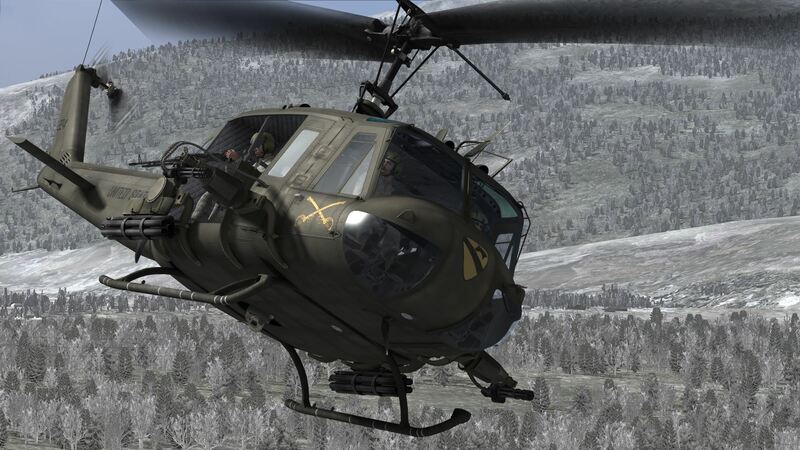 The UH-1H variant featured in DCS is the most produced variant, consisting of a lengthened UH-1D variant with the upgraded Lycoming T53-L-13 engine (1,400 shp) originally designed as a troop carrier / cargo transport. However, the UH-1 Huey was also modified to serve in a gunship role, carrying a large amount of weaponry such as the 7 inch FFAR rockets in rocket pods, 7.62mm miniguns on flexible mounts (controlled by the co-pilot) and 7.62mm machine or miniguns for the side gunners. Overall the Huey can perform a multitude of roles, but in every role it serves it functions as the workhorse aircraft in DCS and backbone of any armed force, providing troop transport, Close Air Support and can even carry out logistical services by transporting cargo, both in the fuselage as well as by sling loading cargo underneath the aircraft. The Huey is a conventional helicopter with a main rotor to create lift and an anti-torque rotor to prevent the fuselage from exhibiting rotational tendencies caused by the main rotor spinning. Due to the older design of the Huey there is little in the way of automation, although this also means that the included systems are uncomplicated and easy to get to grips with. The Huey is very much an aircraft that is well-suited for introductions towards helicopter flight: although you might get a handful with trying to learn how to control the Huey at first, it is an excellently rewarding aircraft to learn and fly due to the hands-on and 'pure' flying experience. The cockpit of the UH-1H Iroquois, better known as the "Huey," is laid out into three main sections, and although it may not be as ergonomic as a HOTAS system like that on the A-10C or similar US aircraft like the F-16, F-15 and so on, it emphasizes function over form. After all, it is a Utility helicopter. The cockpit can be divided into the following sections. The Main Instrument Panel is sectioned into thirds, the outer two containing identical layouts of essential flight instruments for both the pilot and copilot, just as the flight crew would aboard a modern commercial aircraft. The center third contains information pertaining to electrical, fuel, and engine systems. For simplicity's sake, we will call the sections that pertains to flight our Flight Instrument Panel, and the center third our Systems Monitoring Panel. First, let's go over the basics of the Flight Instruments Panel, which we will abbreviate from now on as FIP. The FIP, as stated previously, contains all the necessary information to properly fly your aircraft. If hypothetically visibility were suddenly reduced to nothing, you could still fly your aircraft all the way home without a scratch, just from the information provided to you though your instruments. That said, let's start with the basics. The first thing you'll likely see on the panel, and our "central" instrument, is your attitude indicator, sometimes called an artificial horizon. This is the black and white ball that tells you which way the nose of the aircraft is oriented from level. White is oriented above the horizon, while black is oriented below. The central W, or "wings" of the instrument represent your aircraft in 3D space, and the ball will move in reference to the static W in both the pitch and roll axes. 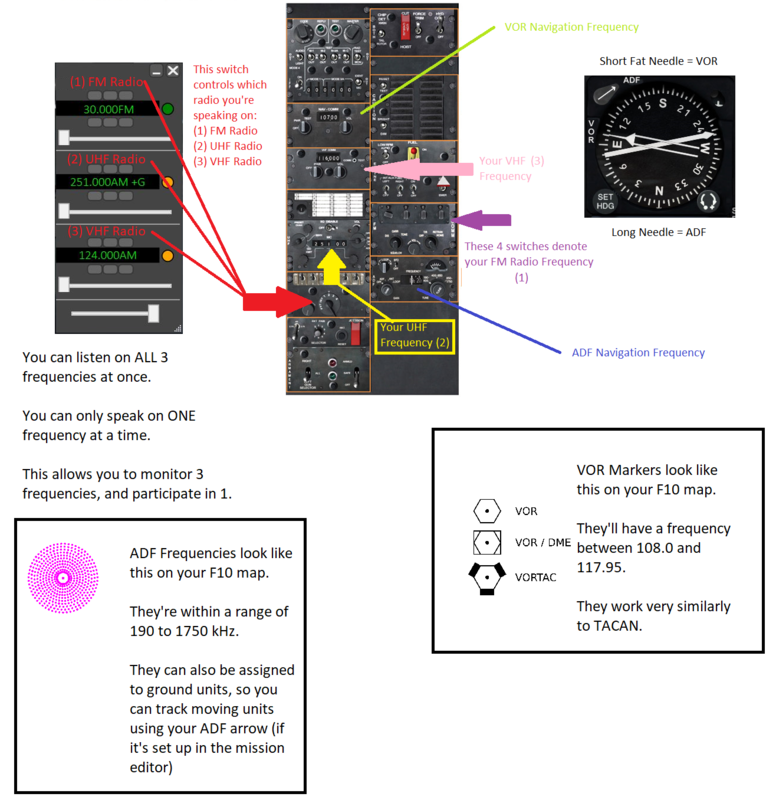 Note that the W and the Ball can be manually adjusted, but for our purposes, and most practical purposes in DCS, you should leave it as is when you hop in the helicopter, as it is centered and calibrated by default. Immediately to the right of that is your barometric altimeter. Note that this should be zeroed while on the ground at the airfield or FARP you take off from. Very important! The altimeter shows your aircraft's height, or altitude, above the set zero point. Immediately below the altimeter is your Vertical Speed Indicator, or VSI. This shows your aircraft's vertical speed through the air in Thousands of Feet per Minute. Another way to think about this is altitude change over time. The needle will rest at Zero when your barometric altitude is not changing, will rise when ascending, and dip when descending. Below the Attitude Indicator is the Directional Compass, which is coupled with an Artificial Direction Finder and Horizontal Shift Indicator. This is the more accurate of the two compasses on board, the second being the ball compass extending from the right hand side of the panel. The Artificial Direction Finder, or ADF, is your tool for finding home when you've got no other means to do so, such as GPS. The ADF works by tuning into specific radio frequencies, and homing in on the direction they were emitted from. Tuning your ADF is a manual process and will be covered further in the Navigation section. Immediately to the left of the Attitude indicator is your Airspeed Indicator, measured in Knots, or Nautical Miles per Hour. One Knot is equivalent to roughly 1.12 Miles per Hour. Note that during low speed flight, your Airspeed indicator will not function, as the airflow from the rotors will disturb the air around the helicopter so that an accurate measurement cannot be made. Below our airspeed indicator is our Radar Altimeter. Although outdated manuals for the Huey will say it's not implemented, it clearly is now. It requires power, which is activated on the overhead panel, to be discussed further on. For now, all you need to do to make it work is to rotate the knobs that read SET so that the LO flag is at your desired low limit, and the HI flag at the desired high limit. (Note, unlike the KA-50, when your radar altimeter reads you as below your desired low point, it only illuminates a lamp, and no sound is made. Same goes for the high. For what it's worth, the settings should be set to simply activate the instrument, and no real precision work needs to be made. I usually put the low point at 0 or just above, and the high point at the max limit.) The maximum effective altitude of your radar altimeter is roughly 1500 feet. Above that, it stops functioning and is put into an idle state. Below our radar altimeter is our bank and sideslip indicator. This will be covered more under the basic flight section, but for now all you need to know is that ideally the ball in the slip indicator should be centered. The center third of the panel contains our Systems information in various forms: Engine and Rotor RPMs, Gas Producer power, torque, exhaust temperature, Fuel Quantity, oil temperature and pressure, and various voltages and amperages being supplied to and from the aircraft's electrical systems. The controls for the collective, throttle, cyclic, antitorque rotor, and more are all in front of your pilot. In your right hand, centered in between your legs is your Cyclic control. This stick is coupled with a force trim function. To learn more, see the SYSTEMS subsection. In your left hand is the collective, which also contains the throttle, and other functionality such as search and landing light controls. Again, to learn more, see the SYSTEMS subsection. Thermal modelling of the DCS Huey is not yet modelled, as such you can set your throttle to max and leave it there. Simply moderate the collective as desired.